Fiction – paperback; Pan Books; 312 pages; 2008. 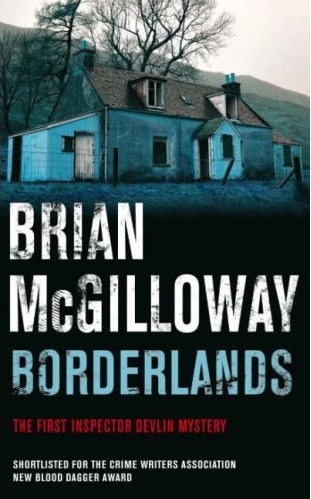 Brian McGilloway’s Borderlands, which is the first Inspector Devlin mystery (the second is Gallows Lane), was shortlisted for the Crime Writers Association New Blood Dagger in 2007. And it’s easy to see why. The writing is effortless, the mood suitably dark and sombre, and the storyline in which a teenage corpse is discovered on the border between the north and south of Ireland, moves along at a good pace, with some interesting and unexpected twists in the plot line. The characterisation is superb, and Inspector Benedict Devlin is a likable if somewhat flawed lead character, far from the aging and troubled grumps that seem to populate the Scandinavian crime fiction to which I’ve recently become enamoured. But he feels no less human than them and, if anything, tends to tread a much blurrier line between right and wrong, vengeance and justice. The story itself is a straight police procedural that opens with the discovery of a teenage girl’s body on wasteland a few days before Christmas. The only thing she is wearing is a pair of white cotton underpants, turned inside out, and a distinctive gold ring set with a moonstone surrounded by diamonds. It is this ring which provides a valuable clue in tracking down her killer. Not long after the police investigation, led by the Irish Republic’s An Garda Siochana, gets underway another teenage body is discovered, this one in a burnt out car. Are the two killings linked? And how does the disappearance of a local prostitute 25 years earlier fit in? This is a disturbing but strangely compelling read. The case is complex enough to keep the reader guessing all the way to the end, and coupled with the hint of police corruption, there’s a good dose of moral outrage to be had as well. I thoroughly enjoyed Borderlands and will certainly hunt out the paperback version of the next in the series.